There are two ways to get to Machu Picchu: hiking the Inca Trail or taking a train and bus combo. At Knowmad Adventures, a travel company that creates innovative and custom trips to South America, we find when travelers hear ‘The Inca Trail’ it often summons images of tent camping and multiple days of difficult hiking. But did you know you can hike just a part of the Inca Trail to get to Machu Picchu? An alternate option to the full Inca Trail, this fantastic single-day hike culminates at the Intipunku Sun Gate overlooking the mysterious citadel of Machu Picchu just as the Incas did centuries ago. Find out how you can hike along the Inca Trail for one day to arrive to Machu Picchu and why you should consider including a hike to Machu Picchu in your trip to Peru. 1. WHAT IS THE 1-DAY INCA TRAIL? The 1-day Inca Trail, also called the Inca Trail Express, is a single day trek along the final stretch of the traditional Royal Inca Trail. It showcases beautiful mountain scenery, orchid flora, and bird wildlife before arriving to the Intipunku Sun Gate for an unforgettable first overlook of Machu Picchu. En route you see the Chachabamba ruins not seen on the classic Inca Trail route, and Wiñay Wayna, one of the larger ruin sites seen on both the full Inca Trail trek and the shorter, one-day Inca Trail. Board the early train in the Sacred Valley towards the town nestled below Machu Picchu, Aguas Calientes, but get off early, at the Kilometer 104 stop, to begin this one-day hike to Machu Picchu. The well-preserved trail first crosses a footbridge over the Urubamba River and you immediately step within Incan ruins at Chachabamba, believed to be a former important religious site. From there, a gradual 2- to 3-hour morning ascent takes you along the mountainside towards the terraces of Wiñay Wayna, an Inca site built into the hills overlooking the river valley. These ruins, meaning ‘forever young’ in Quechua, are impressive in scale and only accessible by hiking. Often you can be one of only a few visitors. This single day Inca Trail hike is immersed in verdant mountainsides pebbled with ancient ruins and flowing rivers. After Wiñay Wayna, follow the trail inward into the cloud forest and connect with the traditional final day portion of the Royal Inca Trail. A last staircase of Incan stones brings you to Intipunku, the Sun Gate, and your first bird’s-eye views of Machu Picchu. Admire the construction and majesty as you head closer to the ancient citadel down a sloping path, until you arrive at the site briefly before taking one of the buses down to Aguas Calientes for the night. Arriving to the Machu Picchu citadel in the afternoon after the 1-day Inca Trail hike means many of the visitors to the site have already left. The crowds have faded, the clouds had more of a chance to burn off, and your first view from above is picturesque. After this first glimpse, rest up and return the next day to completely revel in the many mysteries of Machu Picchu. On all Knowmad custom Peru trips, we always work to keep you away from the crowds – talk to a Trip Specialist today about how Knowmad does the Inca Trail. Like the multi-day Inca Trail trek, the 1-day Inca Trail is a permitted hike. However, the shorter Inca Trail is a much lesser-known alternative. Permits generally do not sell out, unlike the multi-day trek which can sell out more than 6 months in advance. The Inca Trail is open year-round, except for the month of February when it is closed for maintenance. 2. HOW HARD IS THE INCA TRAIL EXPRESS? The Inca Trail Express hike to Machu Picchu is a full day of hiking, covers approximately 8 km (5 miles), and generally takes 5-8 hours. The total elevation gain is 1,700 feet, from the start of the hike to its highest point. The terrain is what Knowmad guides like to call “Peruvian flat” – a combination of flat earth trail at a bit of an incline mixed with clusters of Incan stone steps every few minutes. For some it is a challenging hike, for others less so. This hike is great for moderately-active travelers who are well prepared for a full-day hike. The short Inca Trail hike is at altitude (between 7,000 – 9,000 feet), so as with all travel to altitude Knowmad recommends a minimum of 2-3 nights acclimatization before any full day hike. This and other tips on how to avoid altitude sickness contribute to an enjoyable hike. Also, for any hike in Peru, it is a good idea for novice and experienced hikers alike to familiarize themselves with the route and trail, do practice hikes prior to the trip, plan footwear well ahead of time, and take time during the hike to pause and enjoy. What’s special about this one day Inca Trail hike is that the river basin where you begin is visible the entire first half of the day until you arrive to the Wiñay Wayna ruins, making it that much sweeter when you look down at where you started and know what you’ve already accomplished. It is also just one day, which means that even if the hike is a physical stretch, you can plan your customized itinerary so that the day activities both before and after involve relaxing and recovering. Since the day starts early, you have a full day to take your time on the hike, while more active hikers can challenge themselves to complete the trek earlier in the day. Walking at a steady, slow pace from the beginning ensures enough energy for later in the day. The short Inca Trail is a great Inca Trail hike option for travelers who have limited time, physically are not able to or do not want to do a strenuous multi-day trek, or for those who prefer to stay in hotels rather than camp. You can decide between the short Inca Trail and the long Inca Trail based on these factors: 1. How much time you have If you have a limited number of days in Peru, but still want to experience one of the most famous hikes in the world, the Inca Trail one-day hike is a great option. It gives a taste of the Royal Inca Trail, without having to allocate several extra days to do a multi-day trek in Peru. Also, the Inca Trail Express hike is a good option for those planning a last-minute adventure: the permits are far less likely to be sold out than the classic multi-day Inca Trail permits. 2. The activity level of your travel group The full Inca Trail can be intimidating with 26 miles to hike at altitude over multiple days, and 3 nights of tent camping. (Knowmad has designed a unique route that is an approach to the Inca Trail hike that keeps you away from the crowds). The physical challenge of the multi-day Inca Trail trek is often understated by commercial companies. However, the single day Inca Trail hike is much shorter at approximately 5 miles, and is great for both avid and novice hikers alike. It’s an invigorating hike and for moderately-active travelers an excellent alternative to the longer and significantly more physically demanding 4-day Inca Trail trek. There is something so satisfying about working hard, even on a shorter distance hike, to earn your first glimpse of Machu Picchu. 3. How much you want to see Peru is overflowing with unique historic ruins and vibrant cultural experiences. With the 1-day Inca Trail hike, you open up additional days for other explorations in the Sacred Valley: visit the ancient salt pans at Maras, kayak the clear waters of Lake Piuray, or learn the weaving traditions with the women of Umasbamba. Also, hiking to Machu Picchu you will see ruins, waterfalls, and countryside you’ll miss if opting to take the train. If you are interested in crafting a custom Inca Trail trip with unique, off-the-beaten path experiences, call our Trip Specialists at 612-394-2894 or travel@knowmadadventures.com to begin planning today. 4. If you prefer hotels or camping The classic full Inca Trail trek involves camping, while the single day Inca Trail hike does not. Although Knowmad’s multi-day Inca Trail trips have large tents, plush Thermarests, and other “back-country-luxury” touches, it is not for everyone. 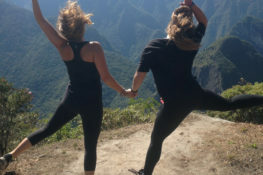 If you like to get a little dirt under your nails with adventure, but a shower and a mattress at the end of the day sounds like more your style, the 1-day Inca Trail hike is the best of both worlds. Instead, perhaps spend more time in your gorgeous Machu Picchu hotel after enjoying the 1-day Inca Trail hike without camping. Hikers on both the long Inca Trail trek and the shorter 1-day Inca Trail hike experience the magical feeling of walking a centuries old path to arrive to Machu Picchu the way the Incas did. Excitement grows as the temples and buildings of the ancient citadel grow closer step by step, stone by stone. A last scramble up a few Incan steps and you gaze like a condor down upon Machu Picchu. When comparing the 1-day Inca Trail versus the 4-day Inca Trail consider: trip duration, how active your group is, and your accommodation preferences. The 1-day Inca Trail is a perfect fit for travelers with shorter travel time or who like hiking but not multi-day camping treks. If you are looking to hike the Inca Trail but aren’t quite ready for the full 4-day hike to Machu Picchu, then take a look at Knowmad’s short Inca Trail itinerary featuring just one day of hiking along the final day of the Inca Trail trek, taking you into Machu Picchu. 4. WHAT TO PACK FOR THE INCA TRAIL DAY HIKE? Layers of clothing are always key for Peru weather, but especially so on full-day hikes. Be prepared to protect against the elements: sun, wind, and rain. That morning wear hiking or athletic pants, a moisture-wicking short-sleeved tee as a base layer, a long sleeve layer, and hiking socks with hiking shoes or boots. Having a lighter long-sleeve jacket for when it’s cold, an outer rain shell in case it rains, and room to put both in your daypack for when it’s hot will make for a much more comfortable experience. Ensure your hiking shoes have been well broken in with active adventures prior to your trip to Peru, so you will not get blisters. It’s also incredibly important to apply and reapply sunscreen. As you are at high elevation and near the equator, the sun is strong and burns easily even when it’s cloudy. Trekking poles are also highly recommended for the 1-day Inca Trail hike. Trekking poles can help propel up the Incan steps when legs are tired, and help stabilize while also taking some impact off your knees when going down. They must be rubber-tipped or have rubber-tip protectors on them to best preserve the historic trail. Hiking to Machu Picchu on the Inca Trail is rewarding. Follow footpaths through Incan ruins, sense historic strength in the stones beneath your feet, and ponder mysteries as you arrive at Machu Picchu. You can hike the Inca Trail on the traditional multi-day trek, or get a taste of the world-renowned trail on the 1-day Inca Trail hike. In both, you will hike centuries old Incan paths and celebrate an unforgettable first view of Machu Picchu citadel through the Intipunku Sun Gate. If you are ready to craft your own adventure to Machu Picchu, give our Peru Trip Specialists a call today at 612-315-2894, or email us at travel@knowmadadventures.com. Remember, boots are made for walking. Chau Chau, Kayli Kayli is an Operations Specialist at Knowmad Adventures, a company dedicated to creating unique, private and custom trips in South America. She has danced, swam, zip-lined and hiked all over Central and South America and is always excited to help others dream and plan their adventures. Read Kayli’s biography and others to learn more about the Knowmad team.